It’s screener season again. The trend toward streamable screeners–an access code rather than a DVD–continues. Definitely fewer discs at this point than any previous year: GREEN BOOK, BOY ERASED, FIRST MAN, DEADPOOL 2, BLACKkKLANSMAN, A QUIET PLACE, BEAUTIFUL BOY, THE WIFE, CAN YOU FORGIVE ME? Invitations to free screenings on both coasts, occasionally Chicago but never closer. Among those who are still sending out DVDs, no one is having more fun with it than Amazon. The packaging for their screeners has creative, audacious, silly, and entertaining in its own right. The first of the Amazon shipments was preceded by three text alerts that a special handling parcel requiring a signature was en route. It arrived looking like something out of MISSION:IMPOSSIBLE, or a diplomatic pouch, with warnings that opening it meant acceptance of the mission. Inside was a disc sealed in an x-ray proofed nickel-poly bag marked with a case number and other codes, as well as a dossier-style book with a tamperproof seal. It wasn’t until you cut through the former and tore open the latter than you knew all this was for the series HOMECOMING. A day or two later, more text alerts, another signature, and a plain white cardboard box the size (and weight) of an old BRITANNICA volume. Plain except for the address label and a large red royal crest seemingly stamped on the back. Inside, a glossy book-spine box of the sort a presentation photo album might come in, stamped in gold script: THE ROMANOFFS. On the back side of the cover, the DVDs were in a red envelope with a gold wax signet-ring seal. In the box (with a handy black ribbon to help lift them out) was the most thorough inside-baseball bound script I’ve ever seen, including plans for FX shots and color-coded pages reflecting which draft of the script was included. There were also a couple dozen glossy 8×10 production stills. Surely the most expensive screener package I’ve ever received. 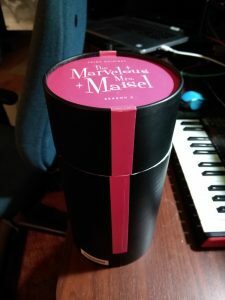 The third and last of the special Amazon mailings was a jet-black tube the diameter of a DVD and almost a foot tall. 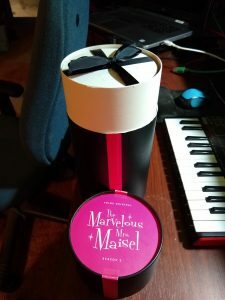 It was sealed with a hot pink ribbon, and the hot pink end caps declared it for Season 2 of THE MARVELOUS MRS. MAISEL Cut the ribbon and slip off the lid, and you’re greeted by more ribbon, black this time, nearly tying up a hot pink stack of discs. The rest of the tube was occupied by a dozen or so rolled promotional posters. Compare this to Sony Pictures Classics, which for as long as I’ve been on the list sends out its screeners in those little white envelopes with the clear window–the epitome of minimalism. I have to admit I actively enjoyed the over-the-top Prime Video packages, which felt more like unwrapping a cleverly wrapped gift than opening the mail. I got the feeling someone (or several someones) had fun coming up with them, too. Marvelous Mrs. Maisel screener package from Amazon Prime Video.